Our Sea to Sky vacation travel package to Boston is perfect for families of all ages looking for a fun and unique way to see Boston. First enjoy the original Boston Duck Tour that takes you through the city streets and along the banks of the Charles River. After completing your tour, you will climb up the Prudential Tower to the Skywalk Observatory to see Boston from above. Then you will be treated to a one of a kind attraction at the Mary Eddy Baker Library. The Mapparium is the world famous three-story stained glass globe they one walks into and enjoys an original presentation that features a rich orchestration of words, music, and LED lights to illustrate how ideas have traversed time and geography and changed the world. Boston from Sea To Sky is the perfect daytrip or overnight package. * Price adjusts for your departure station. 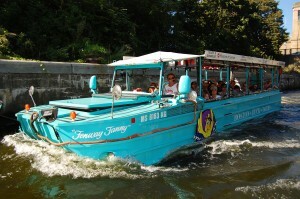 Boston Duck Tours operates from March 21st until November. In the offseason we offer Old Town Trolley's hop on and off tour. This tour is perfect for an overnight stay so that you can take your time to explore more sights throughout Boston.